We are counted amongst the reckoned names in the industry, engaged in offering designed range of Non Woven Bags. Our entire product range is highly demanded across the world owing to their smooth finish and attractive designs. Using superior quality fabric, these bags are designed under the stern vigilance of adept professionals as per the ongoing fashion. 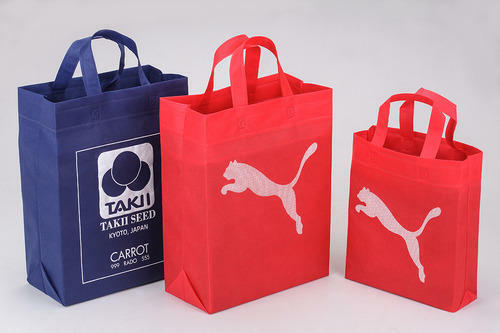 Clients can avail these bags in varied sizes, colors and designs as per their requirement. We Panorama Enterprises are only Single Manufacturer of Cheers Sticks in India & Production capicity is 50000/Day, We are Exporter, Importer and Supplier of the premier Cheers Balloon And Sticks, Paper Bags, Non Woven Bags, Customize Non Woven Bags and Non Woven D Cut Bags.The products of the company find its applications for various sectors and for their promotional, branding and awareness campaigns. With the capacity to manufacture, export & import these products in huge quantity, our passion to deliver clients both dynamic and cost effective results, we have become the most trusted name in the entire sector for more than a decade. During these years we have also served some of the international leading brands like Puma, Nike, Titan, Reliance Ind. Ltd., ITC, Cadila Pharmaceutical etc. As we are always open for communication, we would like to know your needs and cater the customized solutions to you.